The following (Part 1 June, Part 2 July, Part 3 August) is excerpted from a talk originally given at the Goethe Institut in Sydney on April 18, 1999 and subsequently published in London by the Wagner Society of the United Kingdom in 2001. There are several versions of the ancient Greek myth of Orpheus. In the best known of these Orpheus goes down to the Underworld to seek the return of his wife Eurydice who had been killed by the bite of a snake. The lord of the Underworld agrees on the condition that Orpheus should not turn round and look at Eurydice until they reach the Upper World. The great singer and musician who could charm trees, animals and even stones could not survive this final and most perilous of temptations. He turns to look on his beloved wife and she is lost to him forever. Another version of the myth tells of Orpheus being torn to pieces by the Thracian women or Maenads; his severed head floated, singing, to Lesbos. Wagner's dismembered head continues to sing, unheard by many and misunderstood by most. That beautiful yet volatile singing head with its Janus face, enigmatically poised between black holes and galaxies; that is the head we still find puzzling. And because our civilisation does not like puzzles, and wishes to rationalise whatever has provoked it to think or feel, our best critical efforts have reduced one of the greatest creative and cultural phenomenon of Western culture to manageable proportions. Well, Wagner continues to ascend, leaving Wagnerism behind to do battle on any number of fronts, whether at Bayreuth with its interminable family squabbling, or in the raft of prose that has followed in the wake of the German gigantomane, or through those cliches that Wagnerian ideology has left us with as the Valkyries ride their helicopters across a Vietnamese apocalypse or another wedding is inaugurated to the strains of the bridal chorus from Lohengrin. That is how we now manage the Wagnerian cosmos. Cliche helps us to feel comfortable near this unquiet grave with its all-too-human disturbing element. Humour helps us, and it's necessary—we haven't the fortitude, the talent, the persistence, or, indeed, the genius, to bring into being imperishable works of art. We like to laugh when Anna Russell tells us, ‘I'm not making this up you know’. But of course that is exactly what Wagner did do; he made up an entire aesthetic and cultural world that we still have not been able to come to terms with. We try from time to time to make sense of the life and the work, but never without those attendant twins, partisanship and antagonism. 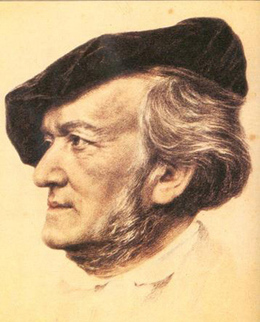 The world may celebrate his work, technology may bring his music to every part of the planet, yet another monograph may be published; Wagner turns to look for his audience, and at once he loses that audience. The bloodlust that can be unleashed by a good Wagner performance, the obsessions notoriously associated with Wagnerism, the strident approbation and denunciation—these are not the cultural signifiers of classicism freely given to Shakespeare, Mozart or Goethe. Wagner evades classicism still; yet that is his predestined end. We are still too close to the psychic firestorm of his imagination, and we are still too disturbed by the misuse of his art, for that classicism to show any signs of emerging. Even as passionate a Wagnerian as Michael Tanner cannot bring himself to fully equate Shakespeare and Wagner, an equation that cultural history proposes but which we are not yet up to accepting. Wagner's uncertain cultural status reaches beyond our historical moment. Perhaps a Hegelian analogy is best: thesis, antithesis, synthesis. The life, 1813-1883, represents the thesis—and what a proposition it is. The twentieth century represents the antithesis replete with reductionism, antagonism, equally disreputable fanaticism and hatred. It remains for the future to offer the synthesis. And when that synthesis occurs, then Wagner will have ascended to the Upper World; his audience will not flinch from looking at him directly. Shakespeare was lucky not to have left much biographical debris behind. When the biographers and critics got to work, the focus of their studies was necessarily on the plays and poems themselves. The lacerated spirit that gave birth to the murderous rampage of a Macbeth, the suicidal melancholy of a Hamlet or the self-hatred and disgust of a Lear was easily accommodated to textual analysis and theorising because biographical motive was missing. The hunt for the Dark Lady of the Sonnets was a pastime for some but, on the whole, scholars were prepared to indulge Shakespeare's evident greatness. Only recently have they come around to asking why Shakespeare's younger daughter couldn't write. No such luck for Wagner. There is enough biographical material laid on the line to keep critics in clover until the end of time—letters, autobiographies, diaries, pamphlets, theoretical writings. And that's just the primary material. Has any scholar yet read all of it? Then there is the secondary material and we know that it is now beyond the ability of anyone to read it, let alone make sense of it. This deluge of material shows no sign of abating. Are we now any closer to understanding the phenomenon of Wagner? Wagnerism seems to be one of the chief ways with which we seek to cope with what is now considered to be the 'problem' of Wagner. Thus two mutually antagonistic modes of thinking fail to reach any accommodation with one another. It seems that Wagnerian historiography must advance, not by the slow accumulation of historical and cultural detail, but always explosively, so that an apparent understanding of events is wrenched apart by either previously unknown factual details or fresh polishing of a facet of the Wagnerian rough diamond.